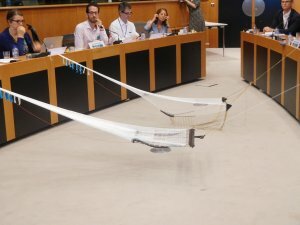 A highly charged debate on electric pulse fishing, organized by the Intergroup for Biodiversity & Ecosystems Services, took place in the European Parliament yesterday, Wednesday 21 June. 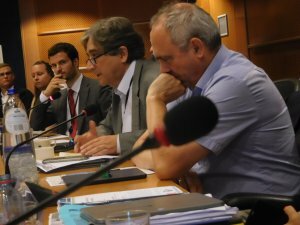 Under discussion was the issue electric pulse trawling as a more sustainable alternative to beam trawling. A pulse trawl uses electric current to shock fish off the seabed, and is more than 10 times lighter than a conventional beam trawl (240 kgs vs 3,000 kgs). It has huge benefits for fuel economy, carbon footprint, and mechanical seabed impact. Small scale inshore fishers using fixed gears are concerned that, thanks to pulse technology, beam trawl effort is now shifting into more sensitive and environmentally fragile areas, where the impact of overfishing and electric pulses on marine fauna and associated habitats threatens their activities. Allowing the encroachment of electric pulse trawling into these inshore areas in the absence of any effective regulatory and control framework flies in the face of any precautionary or ecosystems based approach to fisheries management. Representing DG Mare, Elisa Roller hailed pulse trawling as “the most innovative, most researched and most fuel-efficient gear”, which she sees as a crucial tool for dealing with the challenges of the landing obligation. As Head of Unit for CFP and Structural Support, Policy Development and Coordination, she is sufficiently satisfied with the evidence from research to allow the mainstreaming of the pulse technique throughout the EU. She highlighted a few outstanding issues that need to be taken care of, which essentially boil down to a misunderstanding on pulse issues, she said. Pim Visser for the Dutch industry called for an increase in the number of licenses for brown shrimp vessels, highlighting the 60 to 70% reduction in by-catch obtainable. Ricardo Serrao Santos drew attention to the ethical issue of fish welfare, and pointed out that innovation could be both Dr Jekyll and Mr Hyde. Innovation was a two-edged sword that was both the cause of and potential solution to climate change, pollution, ocean acidification, and plastic waste. Hans Polet from ILVO – the Flemish Agriculture and Fisheries Research Institute – highlighted that despite much research, there are still significant knowledge gaps as regards the wider ecosystem and longer-term impacts. Bjorn Stockhausen for Seas at Risk urged that regulatory conditions governing licence restrictions for pulse trawling are strengthened not weakened, and that existing licenced operations are evaluated. Small mistakes can make big impacts he said. He pointed out that the repetitive and cumulative effects of electricity over time were unknown. 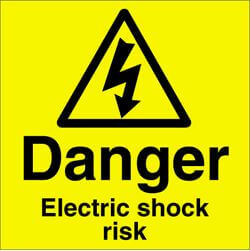 Frédéric le Manach for Bloom drew attention to the ethical issues, stating that it is not acceptable to electrocute Nature; that electric pulses are not selective, all fish are electrocuted.